Ilona Pociunas trained at Westside Ballet under the direction of Yvonne Mounsey, Rosemary Valaire, and Caprice Walker. Additionally, she trained at The School of American Ballet, American Ballet Theatre (New York), and The Rock School of Pennsylvania Ballet summer intensive workshops. You can read more about her training at Westside in her alumnus profile. Ilona joined The Sacramento Ballet in 2001 and was promoted to soloist in 2003, then continued to dance two more years with the company. 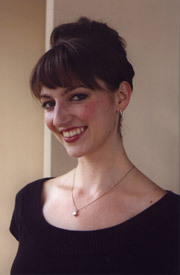 She briefly returned to The Sacramento Ballet in 2009-2010 as a guest artist. Ilona holds a B.A. in Performing Arts from Saint Mary’s College of California. She is currently attending Cal-State Northridge to earn her master’s degree in communication disorders and sciences. She is looking forward to becoming a speech-language pathologist. She currently teaches at the Adult level.